If you plan to host a playoffs party or if you’re just looking for something tasty to munch on while you watch, I’ve got something good in mind. Whether it's hot out or cold out--depending on where you are in the country--it's never a bad time to grill. Plus, wrapping anything in bacon is just plain awesome. Use a knife or other kitchen instrument to remove the jalapeno seeds. Do not use your fingernails! They will burn for hours! Cut the chicken into chunks and place the chicken, pineapple and mushrooms into a Ziploc bag. Add into the bag the soy sauce, vinegar, oil, onion powder, garlic salt and pepper. Seal the bag and squeeze, making sure the chicken and veggies are mixed and coated. Place bag in the fridge to marinate for 45 minutes. (Feel free to also let marinate overnight if it’s easier for your schedule). While the chicken is marinating, cook the bacon. You’re going to want to not get it so crispy just yet–just cook it just enough that it’s not raw, but still pliable. The easiest way to do this is to line a plate with paper towels and place the bacon on that. Stick it in the microwave and zap in 20 second intervals, checking the bacon each time. Remember, you want it beyond raw but still able to wrap around your chicken. (It will crisp up in the oven later on). While the chicken is marinating, you can also prep your skewers. How many you will need truly depends on how large of a chunk you cut your chicken. With the skewers you’re using, be sure to soak them in water and cover for 10 minutes. Then drain. Once the meat is done marinating, it’s time to grill up the chicken. Because you’re also going to cook the chicken in the oven once you’ve wrapped it in bacon, you don’t need to cook the chicken all the way through at this step. You just want to give it some grill marks and that woody flavor from the grill. (If you don’t have a grill, you can always do this on your stovetop with a grill pan). Preheat your oven to 400 degrees F and position a rack to allow for cooking in the upper third of the oven. Once you’ve browned/grill-marked up the chicken, let it cool enough a bit (so you can hold it) and then place a jalapeno piece on each side of a chicken chunk. And then wrap them in a slice of bacon. 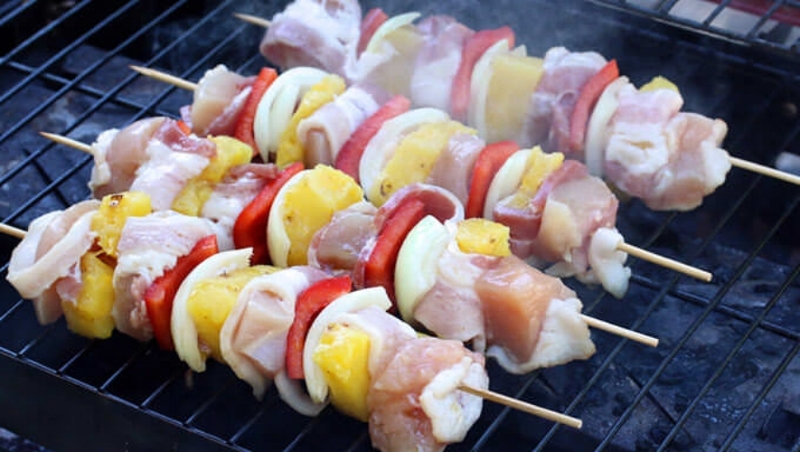 Secure the meat with skewers alternating with mushrooms and pineapple (or bell pepper) chunks. Place the skewers on a large baking sheet or pan lined with parchment paper and drizzle the remaining marinade to soak in the flavor. Pop in the oven and let cook for 5-8 minutes and then turn the skewers over. Let cook for another 5-8. For extra crispy bacon, you can then turn on your broiler and broil the skewers for another minute on each side.